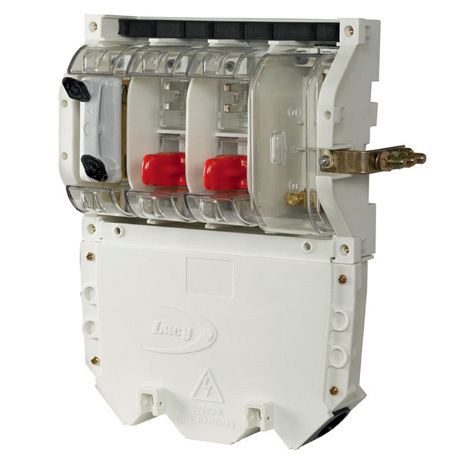 Lucy Switchgear Heavy Duty Cut-outs (HDCO's) with 200amp, 300amp, 400amp, 600amp and 630amp ratings are capable of terminating up to 300sqmm copper or aluminium conductor cables. Lucy Switchgear low voltage switching, protection and fusegear for LV electrical distribution includes street lighting cut outs (single pole SNE), house service cut outs, heavy duty (200A, 300A, 400A, 600A) cut outs, pole mounted cut outs, ABC boxes, and vertical busbar arrangements (Lucy MSDB vertical and Lucy MSDB horizontal types). T&D offer Lucy House Service Cut Outs Both Single & Triple Phase 60A 80A 100A.